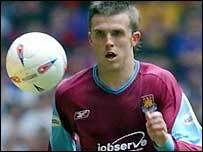 West Brom are on the verge of agreeing a fee with West Ham for Michael Carrick and are set to open talks with him. "There is a bit of negotiating to be done to see if Michael wants to join," said Baggies boss Gary Megson. "We've spoken with West Ham. "That's as far as we've gone but I think we are close to agreeing a fee." Portsmouth's bid of £3.5m for the 23-year-old had already been accepted but boss Harry Redknapp has blamed interest from Arsenal for scuppering the deal. Redknapp said Pompey's bid was put on hold when Gunners boss Arsene Wenger revealed his interest, only to later pull out of a deal. "Arsenal have messed it up. Michael was happy to come, but Arsenal have done in the whole deal," fumed Redknapp. "They came in and never followed it up. They just do whatever they want." Meanwhile, Megson is keen to see his pursuit of Carrick, who has one year left on his contract, pay off. The West Brom boss revealed he had tracking the England international since the end of last season. "One of the things that makes me laugh is people are saying we have now joined the race for Carrick," said Megson. "We've been after Michael since the beginning of June when we realised West Ham weren't going to get promoted. "We tried to get him then and it has been an ongoing process for quite a while." Crystal Palace and Everton have also expressed their interest in the highly-rated midfielder.